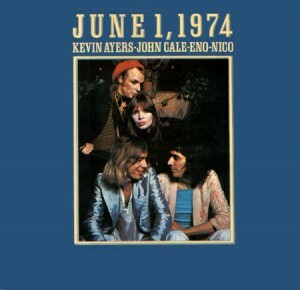 The fortieth anniversary of Ayers, Cale, Nico, Eno live album. Today is the day that I raise a glass or two to Kevin Ayers, the greatest rock star ever in my opinion! I was lucky enough to go to the Birmingham ACNE concert as I believe there were only four or five of these gigs around Britain in June 1974. As a Velvet Underground fan I had gone along to see Nico and John Cale (and when Cale was performing at his most extreme a woman behind me said “this doesn’t sound like the JJ Cale albums I have got ha ha) – I digress – Eno was also known to me from Roxy Music but I had never heard of Kevin Ayers. It is fair to say that from the moment Kevin strolled onstage mid concert I was (what? )…entranced, smitten, amazed, overwhelmed, in awe, gobsmacked!…. Yes all those things. He took over the concert and commanded the stage as the best rock star ever; which is exactly what he is in my opinion. Great songs, superb lyrics, top voice, unbelievably handsome, cool…….what’s not to like? He could always assemble and direct the best musicians, especially bass and lead guitarists, to present his songs on record or live. Look at some of his lead guitarists – Ollie Halsall, Mike Oldfield, Steve Hillage, Cal Batchelor, Andy Summers – all superb! Since then I have been to as many of Kevin’s concerts as I have been able to find which have been quite few and far between over the years (and no internet to advertise them – just relied on NME and local newspapers) and I have also been lucky enough to have met Kevin post gig a few times and he was always the most modest, genuine, affable guy you could ever wish to meet – despite me being a star struck and tongue tied fan – but I guess he was used to that! And so, forty years later, Kevin is sadly no longer with us but his music and our memories are, and for that I am eternally grateful to him. Kevin has enhanced my life immeasurably, as he has touched many others, and he will continue to do so as his musical legacy is discovered by younger generations. This is helped, in no small way, by websites such as this so thank you Rick and Susan for making such a wonderful effort and writing some beautiful accounts of your travels – you have inspired me to make a similar pilgrimage. I love the bit about JJ Cale, that must have been hilarious! Enjoyed Camel recently at Sheffield City Hall with Waggy. Latimer was really on good form. It was great to see him again. I too, along with all Kevin fans are very grateful for the work Rick and Susan have put in to create this website. Keep up the good work. Just one other you might be interested in. Have you seen the Shooting at the Moon t-shirts someone is selling on eBay. I got one a couple of months ago and they are great quality. Anyway, just thought I’d get in touch. See you soon all being well. Hey John! Great to hear from you. I remember Kevin’s Sheffield gigs well. One particularly at the end when that Scottish fan we had met said he would go and get Kevin from backstage to talk to us which unnerved me somewhat. Sure enough Kevin came out and the scots bloke introduced me to Kevin as his greatest fan, aargh the embarrassment! I then took Kevin aback by saying he is now meeting old blokes post gig instead of beautiful women! Oops well, I was in a panic! Ha cheers john will look up moon t shirts ta. waz regards too.